It is our pleasure to welcome you to the Drug Discovery and Therapy World Congress 2019 to be held from the 3rd to the 5th of September 2019 in the beautiful city of Boston. We look forward to welcoming the participants to this exciting conference which will bring together world leaders in their respective fields in the fascinating and intellectual environment of Boston. Prof. Atta-ur-Rahman obtained his Ph.D. in organic chemistry from Cambridge University (1968). He has 1056 publications in several fields of organic chemistry including 740 research publications, 37 international patents, 69 chapters in books, and 210 books published largely by major U.S. and European presses. He is the Editor-in-Chief of four European Chemistry journals. He is the Editor of the world's leading encyclopedic series of volumes on natural products "Studies in Natural Product Chemistry" 50 volumes of which have been published under his Editorship‎ during the last two decades. Eighty two students have completed their Ph.D. degrees under his supervision. Prof. Rahman is the first scientist from the Muslim world to have won the prestigious UNESCO Science Prize (1999) in the 35 year old history of the Prize. He was elected as Fellow of Royal Society (London) in July 2006. He has been conferred honorary doctorate degrees by many universities including the degree of Doctor of Science (Sc.D.) by the Cambridge University (UK) (1987), Honorary degree of Doctor of Education by Coventry University UK (2007), Honorary D.Sc. degree by Bradford University (2010), Honorary Ph.D. by Asian Institute of Technology (2010) and Honorary Doctorate from King of Malaysia (University of Technology, Mara, 2011). He was elected Honorary Life Fellow of Kings College, Cambridge University, UK in 2007. Prof. Atta-ur-Rahman was conferred the TWAS (Italy) prize for Institution Building in October 2009 in recognition of his contributions for bringing about revolutionary changes in the higher education sector in Pakistan. The Austrian government has honoured him with its highest civil award (“Grosse Goldene Ehrenzeischen am Bande") (2007) in recognition of his eminent contributions. He is President of Network of Academies of Sciences of Islamic Countries (NASIC), Foreign Fellow of Korean Academy of Sciences, and Foreign Fellow of the Chinese Chemical Society. Prof. Atta-ur-Rahman has won the International Scientific Corporation Award by Chinese Academy of Science (CAS) for building scientific collaborations between China and Pakistan (2014), has been awarded prestigious “Einstein Professorship” by Chinese Academy of Sciences (CAS), 2013 and has been awarded highest award “Friendship Award of China” on September 28, 2014. He has recently been appointed as Consultant, Education Forum Asia (2015-2020) and Foreign Member of Chinese Academy of Sciences (2015). Prof. Atta-ur-Rahman is the President of Network of Academies of Science in Countries of the Organization of Islamic Conference (NASIC). Prof. Atta-ur-Rahman has been elected as the President of the Pakistan Academy of Sciences twice from 2003-2006 and 2011 – 2014. He was the Federal Minister for Science and Technology (14th March, 2000 – 20th November, 2002), Federal Minister of Education (2002) and Chairman of the Higher Education Commission with the status of a Federal Minister from 2002-2008. Prof. Atta-ur-Rahman was the Coordinator General of COMSTECH, an OIC Ministerial Committee comprising the 57 Ministers of Science & Technology from 57 OIC member countries from 1996 to 2012. He is a Distinguished National Professor as well as Professor Emeritus at Karachi University. In recognition of his global outstanding services to the development of Science and Technology, the largest university in Malaysia, University of Technology Mara, Malaysia UiTM, has established an institution entitled, “Atta-ur-Rahman Institute of Natural Product Discovery (RiND)” in 2013., The National University of Science and Technology (NUST) has also established an Institute “Atta-ur-Rahman School of Applied Biosciences (ASAB)” at their university in Islamabad in 2011. Prof. Dr. Atta-ur-Rahman is the most decorated scientist of Pakistan having won four civil awards by the government of Pakistan, including Tamgha-i-Imtiaz (1983), Sitara-i-Imtiaz (1991), Hilal-i-Imtiaz (1998), and the highest national civil award Nishan-i-Imtiaz (2002). 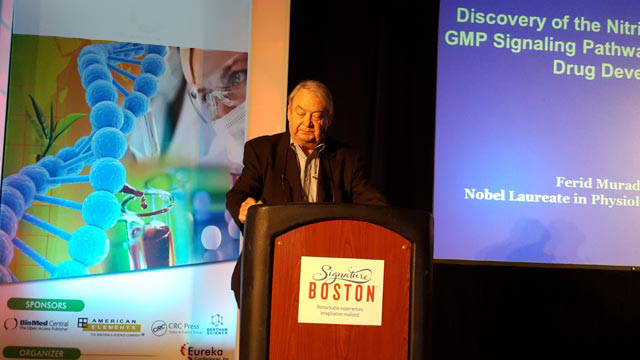 Ferid Murad, Nobel Laureate M.D. is Director Emeritus at the Brown Foundation Institute of Molecular Medicine for the prevention of Human Diseases, Director of the IMM Center for Cell Signaling, Regental Professor and John S. Dunn Sr. Distinguished Chair in Physiology and Medicine, Texas Nobel Scholar at the University of Texas at Houston, and Director of the UT Health Science Center at Houston Program in Intracellular Signaling. Dr. Murad completed his undergraduate work at DePauw University and received his M.D. and Ph.D. from Case Western Reserve University. He had a medical residency at Massachusetts General Hospital and a fellowship at NIH in the Heart Institute. He was on the faculty at the University of Virginia 1970-81 as Director of the Clinical Research Center and Director of the Division of Clinical Pharmacology with appointments in Medicine and Pharmacology. He was Chief of Medicine at Palo Alto Veterans Hospital 1981-88, Associate Chairman of Medicine 1982-86 and Chairman of Medicine 1986-88 at Stanford University. He was Vice President of Research and Development at Abbott Laboratories 1988-93 and Professor at Northwestern University. Dr. Murad has been active in both academic medicine and industry throughout his distinguished career. He has founded and co-founded five biotechnology companies and has advised many cities and government leaders about technology development. His work has concentrated on the field of cell signaling and signal transduction systems. In 1998, Dr. Murad received the Nobel Prize in Medicine for his work with nitric oxide – a colorless, odorless gas that signals blood vessels to relax and widen, which in turn lowers blood pressure. He continues research which leads to a better understanding of how information is transmitted between cells. 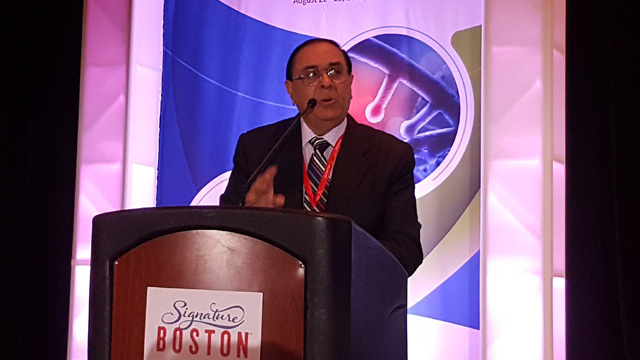 Among his many other awards and honors, Dr. Murad received the prestigious Albert and Mary Lasker Basic Medical Research Award in 1996, the American Heart Association Ciba Award in 1988, and the Baxter Award for Distinguished Research in the Biomedical Sciences from the Association of American Medical Colleges in 2000. He also received the American Society of Clinical Pharmacology Distinguished Research Prize in 2005 and the President’s Scholar Award from the University of Texas-Houston Health Science Center in 2006. He is a member of the National Academy of Sciences, Institute of Medicine of the National Academy of Sciences, Fellow of the American Academy of Arts and Sciences, Texas Academy of Medicine, and Engineering and Science Technology. He is also a member of several foreign academies and is an Honorary or Adjunct Professor at a number of universities. Dr. Murad also serves on the Board of Directors and Scientific Advisory Boards of a number of public and private companies and various foundations and universities. About 140 trainees have worked in his laboratories who are currently academic or pharmaceutical industry leaders around the world.